This morning we are off to the city of Ubon Ratchathani to pluck Piya, the 4th member of our group, from the Arrivals Lounge of the airport. Enroute, we stop briefly at the dam of the Sirinthon Reservoir, where we see this experimental floating Solar Panel Farm. Soon after, we pass through a small city that seems most remarkable for its failed coffeeshop disguised as a giant Tuk Tuk. We have an unplanned 1 hour tour of the suburbs of Ubon Ratchathani when Koen's navigating skills are found wanting in the situation where all roads near the airport are being simultaneously renovated and up-graded...eventually, though, we break into the airport and rescue our comrade. Then it is back to Sirinthon reservoir to eat at a huge floating complex of restaurants. I take the opportunity to observe Piya's beer-guzzling abilities, and conclude that he will not cramp our style at all. Ray: We did 1.5 circumnavigations of the airport before we successfully guessed an entrance, Elizabeth...I am delighted that I was neither driving nor navigating. I read the other day that Japan now has some enormous floating Solar Panel Farms...it seems they are a quite new idea. Piya is Thai...he is from Bangkok, and knows Tim and Koen through all being members of an Upper-class Sporting Club. He is the only one of who is not married. J'aime bien ces petites paillotes. Ray: Ces cabanes flottantes en chaume de palmier sont assez populaires à l'étranger, Martine ... elles sont bon marché et cool. Pfew....good to know that Piya fit in, Ray...... I read the reply to Elizabeth. About the pictures, I think I have never seen so many different unexpected things together. Good for the solar panels!! I'm still stuck on the "failed coffeeshop," Ray. It looks so novel and fun. Hmmm. I wonder why it "failed?" Apart from that, I love the solar panels and the floating restaurants. Ray: Coffee is serious stuff, Ginnie...I am guessing this Tuk Tuk thing is too frivolous to work. This week on my blog seems to be mainly about a day of discovery of strange and bizarre things. Up-country Thailand is Another World, Chris...I love it. 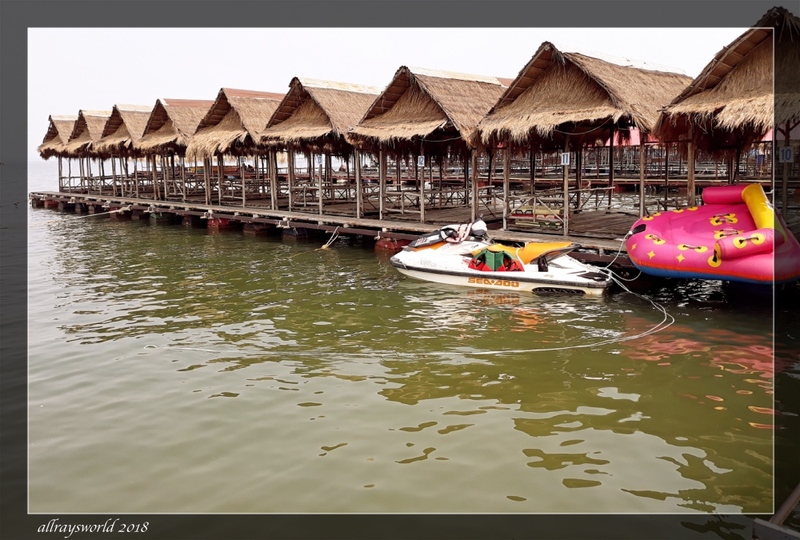 Surprenant contraste entre ces paillottes et ce bateau à quai ..
Ray: La Thaïlande est tellement différente de la civilisation occidentale où je passe mes 50 premières années, Claudine ... les règles, les règlements, les comportements, les cultures ... tout est différent. Floating solar panel farm eh Ray, I thought it was a fish farm at first. Ray: I think that with a bit of clever thinking you could combine the two into a successful installation, Chad. Had the coffee shop failed or not yet been opened ? Ray: Closed following what, I expect, was a short and unsuccessful Open Season, Bill. In Thailand there might be no lack of sunny days! Ray: Solar generation of power is quite easy in Thailand, Philine. Ray: I believe one of the secrets to successful touring like this is to quickly assess traveling companions, introduce them to your ticks and foibles, and adjust your behaviour a little to leave room for their ticks and foibles. Piya turned out to be just fine. Now there's a good idea. All our solar fans are on land so covering agricultural or grazing land. Ray: Aquaculture is big in Thailand, so there has long been a idea to utilise water as useful read estate, Alan. Despite this, there are many land-based solar panel farms starting to appear all around us...I am surprised that they are not on stilts, so that the shady areas underneath can be used for some other kinds of farming. Ah, you picked up a good mate then. I find that the Toyota tuk-tuk is a model I haven't heard of before. Some runner up to the Fortuner? 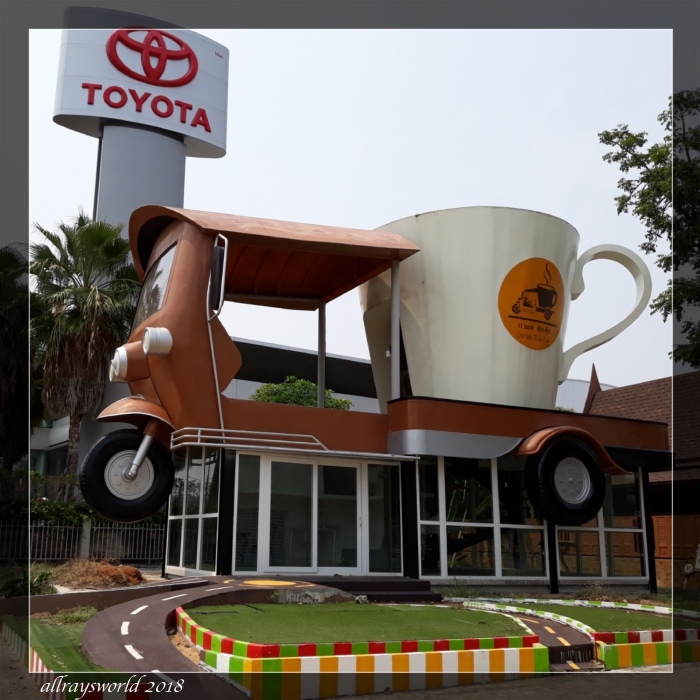 I do drink quite a lot of coffee when on long drives in my Toyota Fortuner [now 13 years old and 250,000km on the clock]. Sounds like an interesting day out, the solar panels on a lake sounds a good idea, over here acres of good farmland have been covered in the damn things where we should be growing food for our ever increasing population. Ray: Growing Solar Panel Farms is big business in Thailand, Brian...huge places are now popping up all around us. There is still much to show you about our activities this day. i think it is a nice initiative, the solar panel farm, Ray. i imagine sunshine is plentiful at least apart from the monsoon months? Ray: Even during Monsoon season, Ayush, there is a lot of sunshine available for farming. The floating farm seems like a good idea to me. Great that the mating (in a new, Aussie flavored way) was successful but sad there was one less choice for a morning cup of joe. It would make a unique stop! Ray: We did stop to grab a coffee there, Mary, and were very disappointed to find it closed down. I didn't know Khun Piya before this trip...we got on very well.